Carolina wearing the blue jerseys twice in the preseason. Lame. Don't they want their fans to see the alternates more, when the games are meaningful? I knew the Panthers would force Dallas to wear blue on the road. At least they are not WAH in the preseason. I guess this was a decision of the new ownership. I am also wondering if they host a playoff game under new ownership, if they will wear black. It does bring back memory of the late 70s-early 80s #CardiacKids era. HoF game is tomorrow night and the match-up has been posted a while... might as well get week one up. Remember any combos posted during the course of this thread prior to game taking place or posted prior to any announcement by the team are an assumption and will be updated as needed. Please give me some 24 hours from the completion of the game to make any corrections as I am normally not at a computer to make changes during the game itself. The Chargers wear all white on the road now. They wore them at San Francisco last year. Baltimore has worn white at home for the first game going back to 2014. Both home games the last two years. That's believable. The Rams are said to be ditching their navy jersey. It's likely they'll be in their "supposed" throwback. The Jaguars and Jets have incongruity of wearing white at home in the preseason. Hard to say. 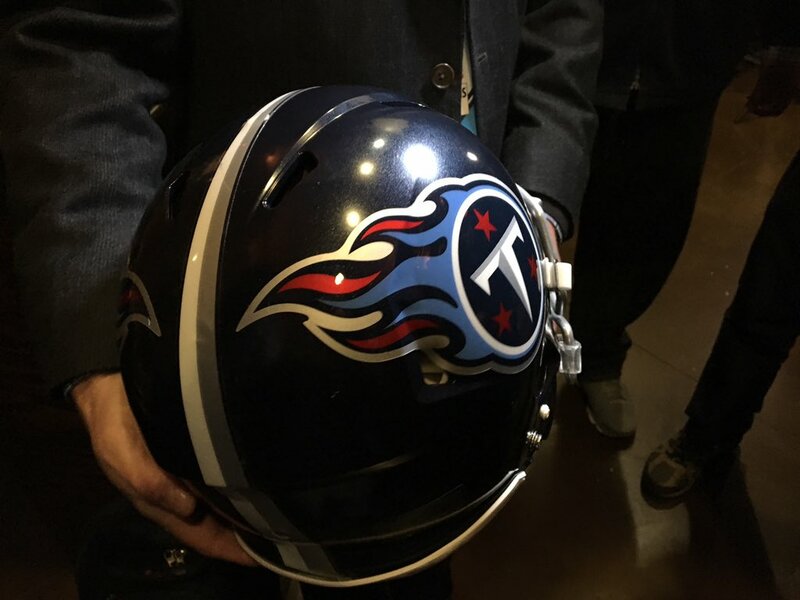 I think your Titans helmet is wrong. Isn't the "stripe" on the back actually white/gray? Denigrate the minimalism all you’d like, but the helmet and number font alone make that uni look really clean to me. Does it have mostly to do with me just feeling sweet relief after enduring five years of the maximalist mess that we used to wear? Probably, but whatever. That Titans combo looks amazing on here. Hopefully that becomes their main road look like back in 2016. That's very odd of the Chargers to choose powder blue 2/3 weeks and be done with them by Week 7, and for a London game against a team they just wore powder blue against. Very strange decision. Just like last year, they don't wear navy until Week 11. This seems to be a trend with them and Carolina. They generally go with darker colors as the season progresses. I wish the Niner game was later in the season. 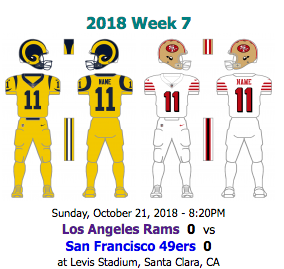 That would be a nice-looking matchup with the Chargers in white navy/navy and SF in white/gold, but as usual, the league chooses to let us down. Outlines to the numbers couldn't have hurt though. They look similar to the Bengals color rush. I prefer the Bengals version which has enough going for it to be visually interesting. Cleveland probably is gonna wear white a lot at home, since the Chargers are wearing blue there. So the Browns are wearing their color rush multiple times and we can agree it will likely be in the Week 3 Thursday game vs the Jets. Carolina and LA are wearing color in Cleveland and they'll likely be in white Week 1 vs PIT and Week 5 vs BAL, so that leaves KC Week 9, ATL Week 10, and CIN Week 16. I hope it's the Atlanta game. I think they'd choose regular brown in Tampa Wk 7. I rather like the way that they look unoutlined; looks crispy and bold, and outlines can add clutter at times without really adding that savory pop of color that some suggest it would (i.e. adding, say, gold outlines to looks like the Packers and Steelers would bring them down pretty hard. I also don’t think that they were necessary on the 2009 set, either.). As I’ve said before, the change that I would make would be teal numbers, which are one of my favorite pieces of continuity in the Jags uni timeline. This would fit with tradition. Bills have been using the white throwbacks, least according to my memory, for the home opener most years since they were first used. 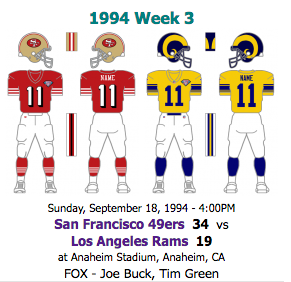 Rams need to break out the white pants for that matchup. I’d even like to see the blue pants (although they have a white stripe). Just FYI, the Nike check on the front facing shot on the left side is black instead of teal. Just letting you know in case you're a perfectionist like me. Great work on these!